Soursop originates from the South American rainforests. It is high in vitamin C, vitamin B1, and vitamin B2. This frozen soursop pulp with no sugar in 1 kilogram size is the cost effective choice for restaurant customers. It is perfect for making fruit nectar, smoothies, fruit juice drinks, as well as candies, sorbets, and ice cream flavorings. For frozen cocktails, just add soursop pulp with your favorite shot of alcohol, lots of ice, 100ml of sugar syrup and blend for 40 sec. Store the product at -18 °C for the highest quality. The corn kernels are used in cooking as a vegetable or a source of starch. They are ingredients in many Asian dishes such as fried rice, noodle, Corn Fritters, Vegetarian Stir-Fried Corn, Corn soup, Spicy Thai corn salad or desserts such as Chè Bắp (Vietnamese Sweet Corn and Tapioca Pearls Pudding) and Maja Blanca (Filipino cornstarch pudding made from Coconut Milk and Corn). Store the product at -18 °C for the highest quality and defrost before cooking. The Kor Khor 43 (RD43) rice (Thai: ข้าว กข 43) is a Thai rice strain that has lower GI value (57.5) comparing to normal white rice at 69. It is one of the finest & quality white rice in the market because of its softer texture than normal brown rice but stickier and tastier when cooked. 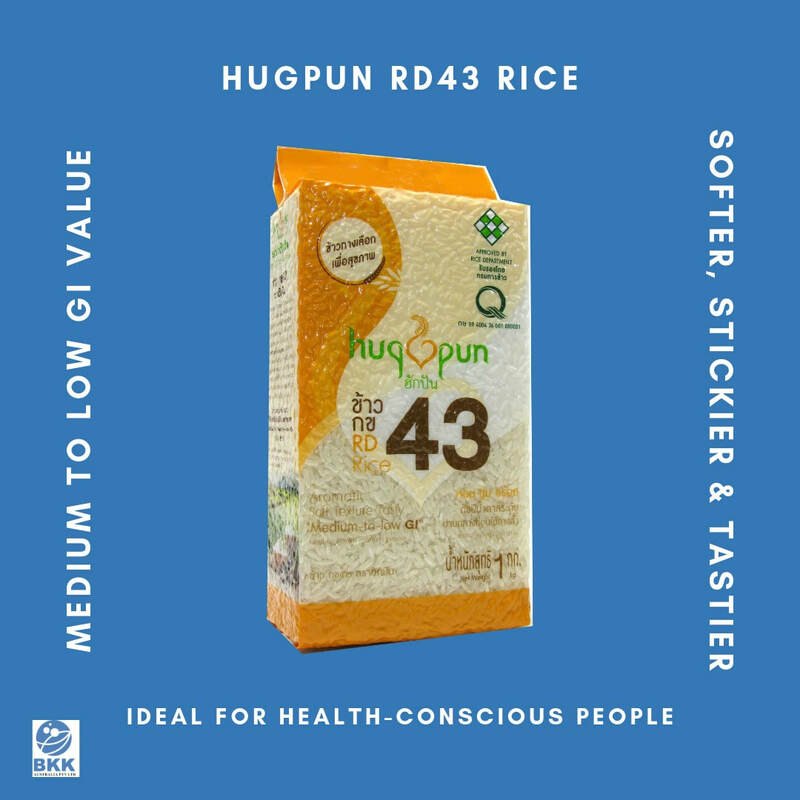 Moreover, research found that it breaks down into sugar at a low level which makes RD43 rice an ideal for those who wish to control blood sugar level yet prefer having soft aromatic white Rice to Brown Rice. Cooking this rice is like cooking jasmine rice as a ratio of rice to water is 1 cup of rice to 1.8 cups of water. If England has Queen of Pudding as its dessert, Frozen Nam Hom coconut juicy pudding is definitely the King of Pudding here! (Thai: พุดดิ้งน้ำมะพร้าวน้ำหอม ผสมเนื้อมะพร้าว). It is made with 3 young coconut textures (jelly, flesh and juice). No cholesterol and doesn’t contain coconut milk. 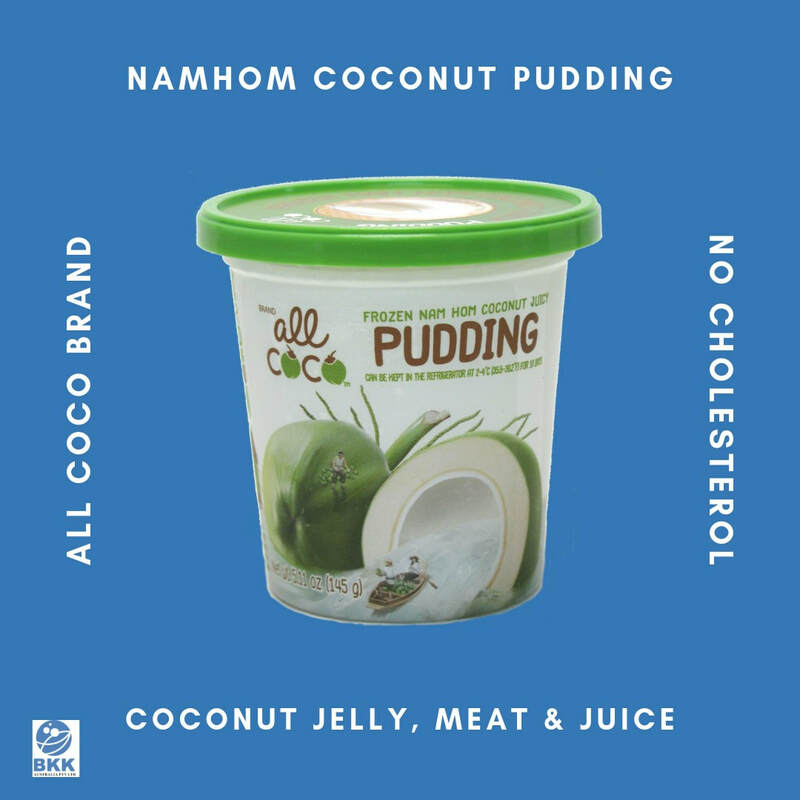 A balance of light sweet taste of 100% Nam Hom coconut water and soft coconut meat makes the texture and the aroma of this pudding so irresistible. Before having the pudding, defrost it for at least 2 hours and shake well. Sweet chili sauce (Thai: น้ำจิ้มไก่) is a popular chili sauce condiment in Thai, Afghan, Malaysian, and Western cuisine. It is commonly made with red chili peppers, rice wine vinegar, garlic, salt and sweetening ingredient such as a refined sugar or honey. It is popular as a dip in European Chinese restaurant dishes such as prawn toast, egg rolls, lettuce wraps, chicken wings and spring rolls. 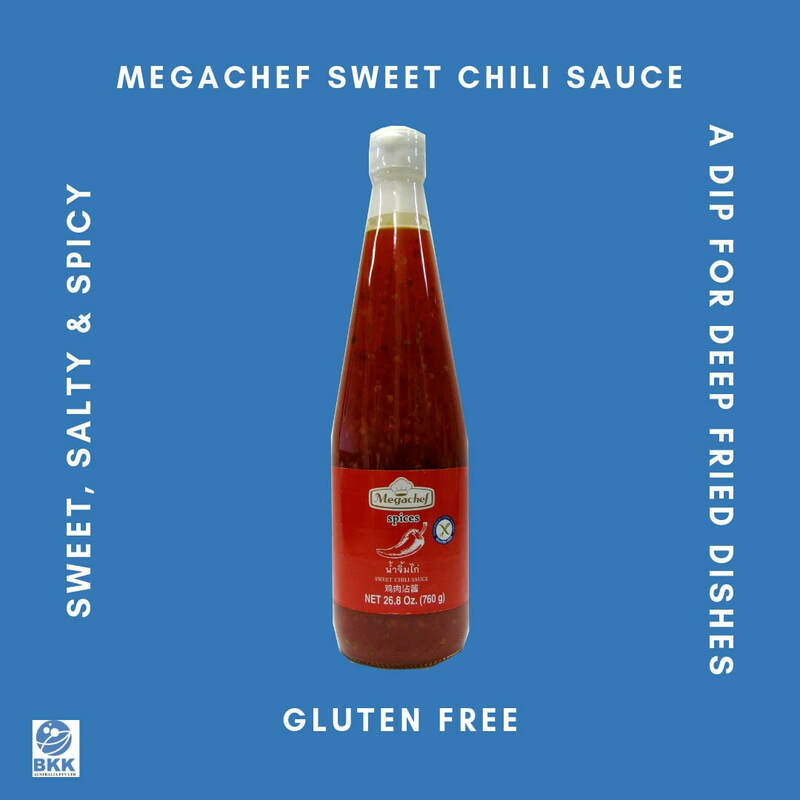 Megachef Sweet Chili Sauce is a product of Thailand that is gluten free endorsed by COELIAC Australia. Combining the popular trio of South East Asian flavours, sweet, salty and spicy, this authentically crafted sauce will send your sense into overdrive with a sweet and spicy taste. Plum sauce (Thai: น้ำจิ้มบ๊วย) is a viscous, light brown sweet and sour condiment. It is mostly used in Chinese cuisine as a dip for deep-fried dishes, such as spring rolls, seafood roll, tempura, fish cake, and deep-fried meat balls as well as for roasted duck. The parents and their kids will love having this sauce with their favourite dish. It is made from sweet plums along with sugar, vinegar, salt, ginger and chili peppers. 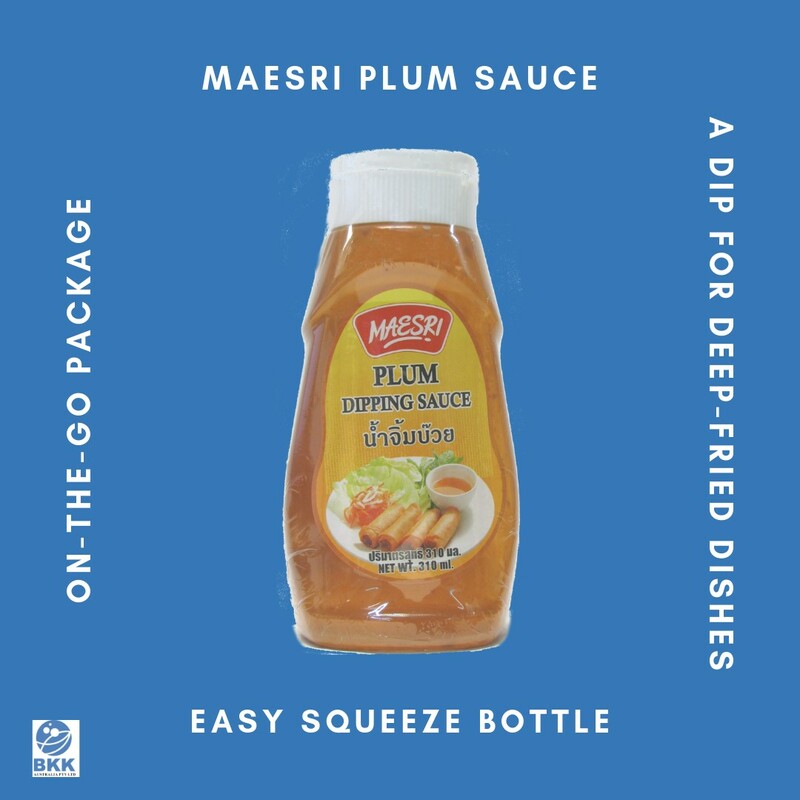 Maesri Plum sauce is a product of Thailand that has no MSG, preservatives and artificial colours. The squeeze bottle makes your life easier as it’s the ultimate on-the-go package with the advantage of dispensing control. Hurry! Contact us while stocks last at 02 9632 0072 (Sydney office) or 03 9791 4425 (Melbourne office). The Mountain brand, Puffball mushrooms in brine is a product of Thailand. In Northern Thailand, this member of the puff-ball family is known as Het Thop or Hed Poh (Thai: เห็ดถอบ, เห็ดเผาะ). It only grows in the wild in the East Northern and the Northern part of Thailand. It is a tiny, globular, almost black mushroom, just 1-2 centimetres in diameter. With this mushroom, you could create several dishes such as puffball mushrooms cooked with coconut milk, red curry and some vegetables, Spicy mushroom salad, Stir fried spicy mushroom with pork, Tom yum Hed Poh or Bamboo shoot soup. The bamboo shoots with Yanang leaves extract in a vacuum packaging is a product of Thailand (Thai: หน่อไม้ในน้ำใบย่างนางแบบเส้น). It comes in a strip shape which is suitable for cooking many Thai North eastern dishes such as Lao bamboo shoot salad, Tom Prer (Thai: ต้มเปรอะ) or Kaeng Nor Mai Sai Biyanang or Bamboo Shoot Soup Northeastern Style. Once you've opened a vacuum-packed bamboo shoot, try to use it up right away. 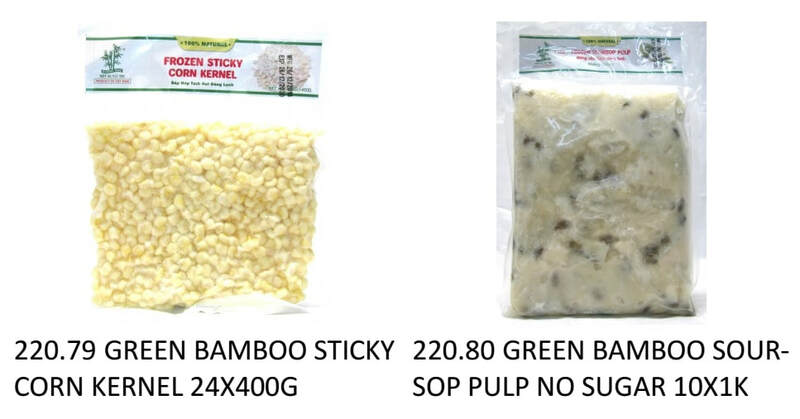 The bamboo shoots half with Yanang leaves extract in a vacuum packaging is a product of Thailand (Thai: หน่อไม้ในน้ำใบย่างนางแบบทุบ). It is suitable for cooking many Thai North eastern dishes such as Bamboo shoot stew with pork, Chicken and bamboo wrapped with banana leaves, Bamboo Shoot Soup Northeastern Style (Thai: แกงหน่อไม้ใบย่านาง). Once you've opened a vacuum-packed bamboo shoot, try to use it up right away. Yanang leaves are popular in Laotian and Thai cuisine. The juice is extracted by bruising the leaves than soaking them in water. It is called nam yanang (Lao: ນໍ້າຢານາງ; Thai: น้ำย่านาง), meaning "yanang water". The yanang water is used to make bamboo soup. In the Lao Isan culture of northeastern Thailand, the leaves are used in the preparation of kaeng no mai (Thai: แกงหน่อไม้, sometimes called kaeng Lao (Thai: แกงลาว.) A juice or extract made from Yanang leaves is used to make the broth, primarily as a thickening agent rather than for its flavour. This product comes in a bottle for your convenience.